When you move to a Hosted Exchange Provider you will often have autodiscover configured so that you can automatically allow Outlook 2007 and Outlook 2010 to configure themselves for your email. If you have an SBS 2008 network you will find this does not work when you in the office because your SBS 2008 Server is configured to use autodiscover to itself and not to use the configuration from your Hosted Provider. So you have to change this, open the tool for Active Directory Sites and Services and then from the View Menu choose Show Services Node. Right click on the server name and choose properties. 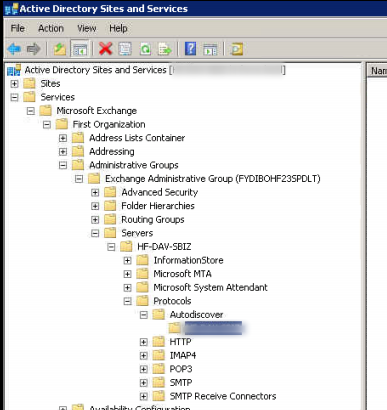 Select the Attribute tab and then find the serviceBindingInformation attribute, this shows the Autodiscover URL. You can now update this to reflect the Autodiscover URL for your hosted provider. 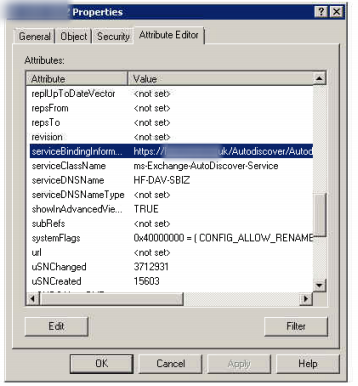 Now when an internal Outlook performs autodiscovery it will lookup the correct service.